Amy McNally (also known as Amy McFiddler) is that chick in a skirt and no shoes who sits on the floor with a violin and a stash of Pixy Stix. Yeah, that one, with the hair. She's been hanging around jam circles like that for 20 years, and has been playing fiddle for over 30 years now. She plays with The Tooles, The Mad City Jug Band, Wild Mercy, and Play It With Moxie. 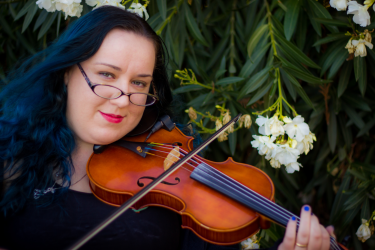 Singing with Lady Mondegreen, performing guerrilla accompaniment, and on recordings with Seanan McGuire, Adam Selzer, and other assorted musicians and rogues, she does folk, Celtic, and historical music too, but considers herself a filker first. She currently lives in the Midwest, and likes Doctor Who, sugar, roller coasters, single malt, books, and pie, although maybe not all at once. Hazardous Fiddle is available for purchase at CDBaby.